With Call of Duty 4 largely humiliating Halo in the Xbox Live popularity contest, you can’t help but feel Unreal Tournament III has arrived late to a party already at full capacity. And yet… when something turns up in this kind of shape, it’s always going to be welcome. Stack this up against the glut of multiplayer shooters on 360 and we’ll award you no prizes whatsoever for guessing which is the offspring of a company that’s been making arena shooters for almost a decade. 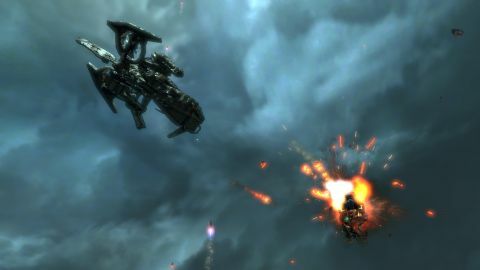 Epic really know their stuff and it’s never been more evident than on the killing fields of Unreal Tournament 3. Everything just feels so tight, so slick, so-self assured. Yes, it might take you five minutes to get used to the lightning quick, almost slippery feel to the controls, but when those controls ‘grip’, you start to realise you’re being guided by one of the best. Everything feels precise, professional somehow – and thanks to its lightning pace, anything else hereafter will seem sluggish in comparison. Plus, what can be applied to the controls, applies to almost every aspect of the action. There’s a level of polish and consideration here, an urgency and immediacy to everything that really sets it apart. Traditional problems have been identified, and there have been clear attempts to alleviate them. Die in one of the larger maps, for example, and there’s no fannying around, trudging over huge swathes of land to get back to the action. You spawn, you tool up from a cache placed under your nose, before teleporting, hoverboarding or driving your way back into the thick of the action. Likewise, smaller maps are meticulously designed, so weapon placement is sensible, important power-ups require skill to reach and post-death respawns take seconds – keeping the flow and intensity of matches at the kind of consistent high that most similar games can only dream of, and wake up from with a wet mattress. These are all decidedly smart little touches that demonstrate an understanding of not just what can potentially annoy players, but what can be done to make skirmishes more enjoyable. Like we said, Epic really knows what they’re doing here. Which is something we realised three hours into the single-player. Now we appreciate it takes a special kind of lunatic to even bother playing something like UT on your own – but in this case, we don’t have much choice, because – at the time of writing – the servers aren’t up and running. But we’ll get to that in a bit. It’s worth mentioning though because, unlike previous Tournaments, Epic have provided a more fleshed-out solo experience – yes, it’s basically the multiplayer modes and maps played out with bots, but some obvious effort has been put in. For starters, it’s got a story (well, of sorts) along with a cast of characters to inject a little bit of personality. It’s even got the odd cut-scene trying to disguise the fact that you’re not actually playing the way you’re supposed to. As well as attempts to put standard multiplayer elements like spawn points and flags (short for ‘Field Latency Generators’ apparently) into some kind of believable context. Admittedly fairly lame, yes – but at least they had the decency to bother. And so should you: Unreal Tournament’s packed with little tricks and tools all of which are introduced in manageable chunks, letting you practice in peace. In this respect, the single player acts like the most thorough kind of tutorial, especially for the new Warfare mode’s rules which can be intimidating if you launch yourself into the multiplayer right off the bat. It also gives you a rare opportunity to drink in what, compared to the competition, is an almost rudely attractive game, with the only fly in the ointment being the fact that Epic’s character design drone is still stuck on its default ‘Beefcake’ setting. Lead character, Reaper, for example, looks so much like Marcus Fenix that you have to wonder why they bothered renaming him, while the rest of the cast also look like bulky Gears of War rejects, who just stumbled out of a space disco. A word for Epic’s genuinely exceptional level designers though: not subscribing to the current trend of making everything as brown as possible, they’ve served up a brilliant mix of natural environments, eastern architecture and eye-catching techno-industrial kill-boxes. You could argue that, for a multiplayer shooter, it’s not entirely necessary – after all you’re not there to admire the scenery – but the admirable arena design does serve a real purpose. Each level (bar a couple of drab exceptions) is distinctive, offering enough variation from location to location, within any given map, for your brain to grasp where you are in relation to everywhere else. It makes learning the maps easier, it makes remembering weapons and pick-up locations less of a chore and, hell, it just makes occupying the spaces a much more pleasant experience. Developers take note: just because you’re fighting in an industrial warzone, doesn’t mean it has to look like the inside of a cereal box. Which, like Quake Wars, leaves us with the task of making a judgement call – not easy given that we couldn’t play the 360 version online at the time of writing. Technically Unreal Tournament 3 is superb and visually it’s in a class of its own – but we couldn’t possibly recommend you buy it for the single-player alone. Which means we have to draw on our extensive experience of playing the PC version online, and recent play time at organised 360 multiplayer events courtesy of Midway and Epic. On the strength of that, we’ve given the score below. Description Bigger, louder and everything awesome that ever made Unreal Tournament worth the server connecting wait. Farewell to Onslaught and hello to the good old days of gore and more.